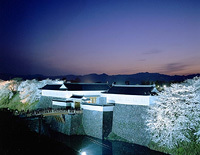 Host international conferences at a hot spring hotel in Yamagata! The feudal lord Mogami Yoshiaki established the basis of Yamagata City, the capital of Yamagata prefecture today, in late 16th century to early 17th century. Yamagata Castle is encompassed by three separate moats and has an approximate size of 2,314,000 m2, on par with Edo Castle and Himeji Castle. 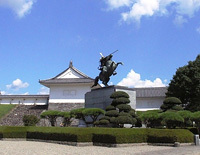 Yamagata Castle has the nickname, Kajo or Haze Castle. This nickname came from the story of the Uesugi Clan's, led by Naoe Kanetsugu, invasion of Yamagata during the Battle of Keicho-Dewa, or "The East Battle of Sekigahara" in 1600. As the story goes, the Uesugi Clan could not see the walls of the castle from their camp, due to the haze. That named stuck and the area surrounding the castle today is now a park called Kajo Park. In the Edo period, Benibana, or safflowers, were traded from Yamagata to Kyoto and Osaka by means of the Mogami River and the Sea of Japan. This was a cash crop for Yamagata because these flowers were highly sought after as they were the key ingredient to make lipstick. The Mogami River was very important in the trade history of the region, as evident by the remnants of buildings and docks in many of the current cities and towns following the river. Some of these remnants have been transformed into sightseeing spots in central Yamagata City, the once castle town. 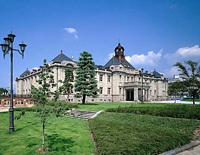 After the Meiji Restoration, western style buildings were constructed around the Bunshokan, the former prefectural government office of Yamagata. Because Yamagata has been virtually unaffected by damage from wars or natural disasters, many historical buildings remain. Recently, the west side of Yamagata station has been redeveloped and convention facilities and hotels have been built. From the observation floor of the Kajo Central Building, views of the mountains of the Murayama basin surrounding the Yamagata City cityscape can be enjoyed. 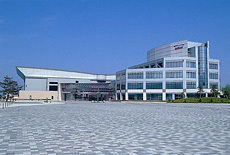 Yamagata Big Wing is a convention center that was constructed near the Yamagata Kita Interchange in 1994 and is used as a convention hall with meeting rooms and big exhibition halls. In 1916, the Bunshokan, former Prefectural Government Office, was built in the European Renaissance style with granite from Yamagata. The Agency for Cultural Affairs of Japan classified this building as Important Cultural Property and it is now used as a prefectural museum of Yamagata. One of the leading sacred places in the Tohoku region in the Hojusan Risshakuji, also known as Yamadera, was established by Jikaku-daishi in 860. While on pilgrimage, the famous haiku poet Matsuo Basho composed one of his famous haiku here, "Silence, and penetrating into the rocks - the cry of the cicada". This haiku is printed in his masterpiece, Oku no Hosomichi, The Narrow Road to the Interior. 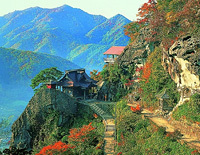 Also in the Murayama region the Jionji Temple in Sagae is also designated as an Important National Cultural Property. Born in Kaminoyama, he was a poet, a member of Araragi School, and a psychiatrist. His first book Shako, or Red Light, influenced Japanese literature. There is a Saito Mokichi museum near his place of birth. The museum exhibits his works and chronicles his life. Born in Yamanobe, he was diplomat, legal expert, and President of the Permanent Court of International Justice at the Hague in 1931-1934. He strove to solve international disputes. His house is still preserved in Yamanobe. 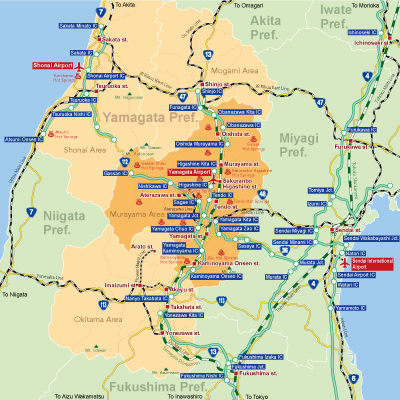 Yamagata City is situated in a valley surrounded on all sides by mountains. Its climate is one where the change of seasons is quite noticeable. Beautiful flowers bloom in spring, very hot su mmers, the changing of the leaves in mountains in fall, and snow blankets all the land in winter. All the pure clean water from the melting snow runs through the fertile land of Yamagata. This climate helps farmers produce rich and delicious agricultural products in Yamagata. Juhyo are a type of Japanese Fur Tree that, due to this particular climate, get incased in ice and show creating world renown natural works of art. 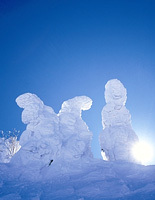 At Zao Onsen and Ski Resort you can ski amongst these wonders. The Mogami River is one of the three largest rivers in Japan and is held entirely within the boarders of Yamagata. 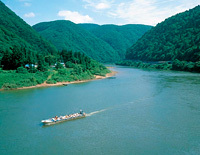 In the past, the Mogami River was essential to the Benibana trade with Kyoto. Today, it is popular with tourists wanting to experience breathtaking natural scenery all year long from the comforts of leisure boat excursions. Mt. 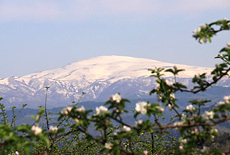 Gassan is one of the Three Sacred Mountains of Dewa founded over 1400 years ago, the other two being Mt. Haguro and Mt. Yudono. Its highest peak reaches a height of 1,984m and is a mountain where skiing can be enjoyed during July and trekking can be enjoyed all year long. *The Heaviest Snowfall value is the depth of the result of one continuous natural snowfall. It is different from the total amount of accumulated snowfall.